Twenty-five years of wireless leadership and expertise in both smart homes and smart buildings is built into all of Lutron solutions, regardless of price, purpose or usage, and its innovative products feature superior technology, aesthetics, cognition, ergonomics and performance. With each smart home system, Lutron takes care of the customer and delivers superior products that combine quality design and technology that works the first time. Lutron products are backed by a deep understanding of technology as well as a 24/7 technical support hotline that a person always answers. Lutron and CasaTunes have partnered to allow customers to use their Lutron keypads and timer events to control their CasaTunes music. CasaTunes provides seamless integration with Lutron RadioRA 2 and HomeWorks QS total home control systems. This integration enables you to use Lutron keypads and timer events to control your CasaTunes music. Setup is simple. In the Settings section of the CasaTunes App, simply enable Lutron, enter your Lutron telnet credentials, and the IP address of your main Lutron controller. Once configured, CasaTunes automatically downloads and discovers your Lutron RadioRA2 and Homeworks QS configuration. Next, configure the CasaTunes Actions to take in response to a Lutron trigger, which can either be a keypad button press, or Lutron timer event. CasaTunes and the Lutron Audio PICO wireless controllers are the perfect companion products, ideally suited for less tech savvy users, or users looking for a simplified control option for CasaTunes. 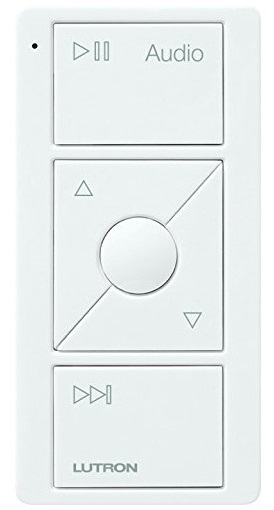 You can configure a Lutron Audio PICO wireless controller for each room. For example, you can configure CasaTunes to toggle the power in the Living Room when the PLAY/PAUSE button is pressed, to change the volume in the Living Room when the UP and DOWN buttons are pressed, to skip to the next track when the NEXT TRACK button is pressed, and to select the next CasaTunes playlist when pressing the FAVORITE (or center) button.